A unique author's strategy that simultaneously determines the trend reversal, entry points and estimated profit levels for each transaction. The indicator can determine entry points on any trading period, starting with the M5 chart to W1. At the same time, for the convenience of the user, an arrow is always drawn at a certain point and the recommended profit levels (Take Profit1, Take Profit2, Manual Take Profit) the Stop Loss level is also displayed. A great advantage of the indicator Trend Switch by LataLab is the presence of a dashboard in which the user can see up-to-date information on potential entry points at the same time on all trading instruments on which the indicator is installed. 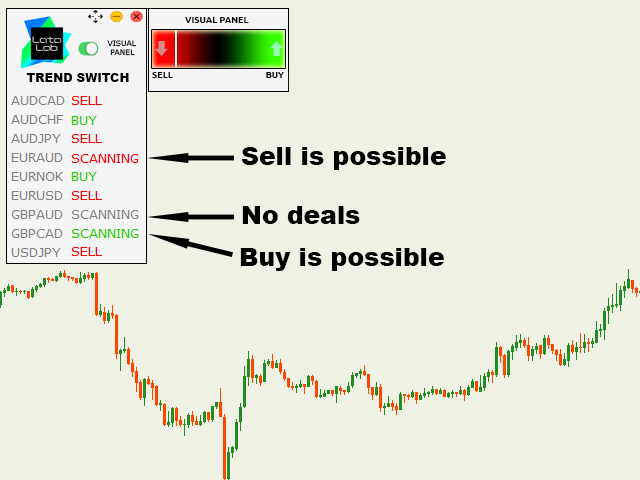 To visualize the operation of the indicator's trading algorithm was created the Visual Panel. The panel shows the areas of potential entry points for Buy and Sell. Profit levels - Take Profit and loss limits - Stop Loss are calculated automatically for each trading period, depending on the volatility of the currency pair and the time frame set by the user. In this indicator, the user can independently set the installation level on the trading chart of the desired profit - Manual TP. Take Profit 1 Level - first Take Profit Scalping goal, a tick appears when it reaches. Take Profit 2 Level - Second Take Profit Global Target, when reached, a check mark appears. Manual Take Profit level - Take Profit is set by the user manually based on his own strategy; when reached, a check mark appears. Stop Loss Level - a cross appears when reaching. Manual Take Profit (ON/OFF) - install TP manually. Take Profit, pips - TP size in pips. Panel (ON/OFF) - display information panel. I made my purchase today and Trend switch by LataLab is superb. when I attach to my chart and see it, the previous signal is truly right and if you could buy other Olena other's indicator such as Cosmic Big deals and Diviner Reversal that I owned it, It does really help to multiply your profits. I am so lucky to have your product Olena. Great and thank you.